Jennifer Hall provided the information for this post. She first told me the story, and then agreed to scan the photo and give us the details. “I think the photo was taken in the late ’40s to early ’50s. My Uncle Robert tells me he’s certain this is the roping club Leo started in Stillwater. I did a little bit of searching on the web and found some information. There is an article about the 60th anniversary of the OSU Rodeo Association. It says Uncle Leo formed the club with his friends in 1946 when they enrolled at OSU. The group started with 6 members. 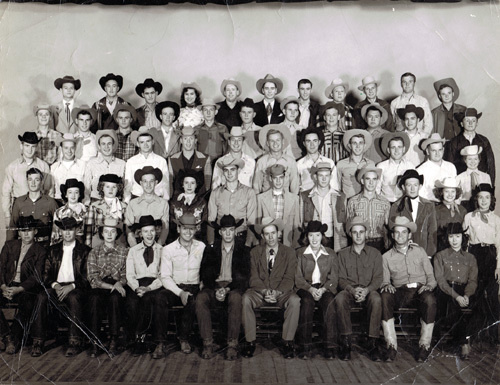 They won first place at their first intercollegiate rodeo in 1948. The trophy now belongs to the National Cowboy and Western Heritage Museum in Oklahoma City. The article names Larry Kilgore as one of the founding members of the group and he is also pictured in the photo I have. My mom knew him and recognized him in the picture. I found another article on OSU’s website about the scholarship my cousins created in Leo’s honor. It tells a lot about Uncle Leo’s. See this OSU website article.